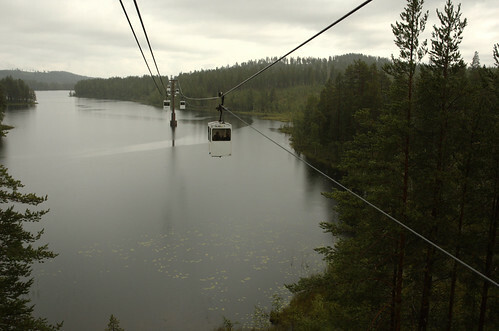 The Norsjö Aerial Ropeway is the longest cable transit system in the world. Image by Silva_D. All rights reserved. Image used with permission by the creator. as long as 270 American Football fields. 4 times longer than Manhattan is wide. 10 times longer than San Francisco’s Golden Gate Bridge. 8 times longer than the National Mall in Washington DC. 300 meters longer than Canada’s Confederation Bridge; the world’s longest over ice-covered waters. 3 times longer than New York’s Central Park. 6 times longer than Vancouver’s Burrard Inlet is wide. 1.5 miles longer than the Florida Keys’ Seven Mile Bridge. 6 times longer than London’s Hyde Park. 3 times longer than all of the islands of Venice are at their widest point. Twice as long as the Las Vegas Monorail. 3 times longer than the longest runway at LAX Airport. 7 times longer than the Champs d’Élysées in Paris. More than 3 times longer than the racetrack at the Indianapolis Motor Speedway. 5 times longer than Berlin’s Tiergarten Park. But that’s only part of the story. Over 3,000 meters of the Norsjö passenger ropeway is built over marshes and lakes and the system is but one small part of an even longer system. In 1989 this 13.2 km section was converted from mining and industrial purposes to tourism usage. This explains the spartan quality of the towers and its incredibly slow speed (only 10 km/hr). The system as a whole, however, is a whopping 96 km long! By far the longest cable system in the world. That it was build in 1943 and is still operational today is even more impressive. 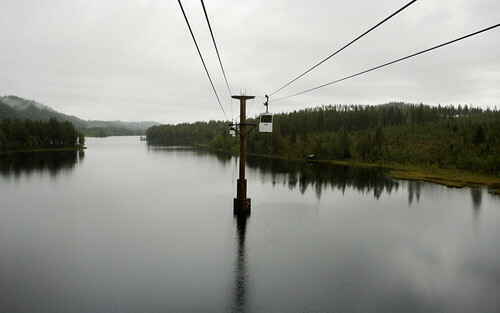 3,000 meters of the Norsjö Aerial Ropeway exist over marshes and lakes. Image by Silva_D. All Rights Reserved. Used with the permission of the author. 96km long? from 1943? wowza I love the "You might also like" feature of the Gondola Project so that I can get reminded of such great past postings!